Whenever I see images like these posted on Golden Age Comic Book Stories, I am reminded that, contrary to current popular belief, weirdness did exist in the late 1940's. 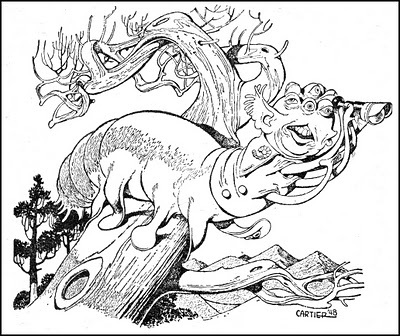 These illustrations by Edd Cartier are from Astounding from 1949-1950. This morning's Sunrise Serenade was "Got A Penny, Jenny" by Stan Kenton and His Orchestra. Click on the song title for a sample from emusic, or click here for the album page. The playlist for the March 30, 2011 broadcast of the Swing Shift Shuffle has just been added to the playlist filing cabinet. The weekly Red Hot Lindy Hop lesson and session continues this Friday with a lesson by Mike and Kimmie and music by Kimmie. Free admission before 7:00 p.m., and $5 at the door afterwards. Today's Sunrise Serenade was "Limehouse Blues" by the Mills Brothers. Click on the song title to listen courtesy of Jazz On Line. Support WEVL On April 5! On April 5, 2011, you can support Memphis’ only independent, listener-supported volunteer radio station (home of the Swing Shift Shuffle) while stocking up on groceries. The Whole Foods Market store in Memphis will donate 5% of its net sale proceeds on April 5 to WEVL. So clip your coupons, make your list, and mark your calendar for 5% Day on Tuesday, April 5, from 8:00 a.m. to 10:00 p.m. at Whole Foods Market, 5022 Poplar Avenue. For more information visit Memphis Whole Foods Market 5% Day or wevl.org. Today's Sunrise Serenade was "Our Father" by the Golden Gate Quartet. Click on the song title for a sample from emusic, or click here for the album page. 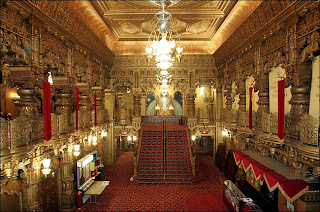 In an homage to the venues of classic movies, rather than the films themselves, Matinee At The Bijou reposted an interesting article by Marco Siegel-Acevedo from his blog The Last Palace about the grand movie palaces of the early 20th Century. 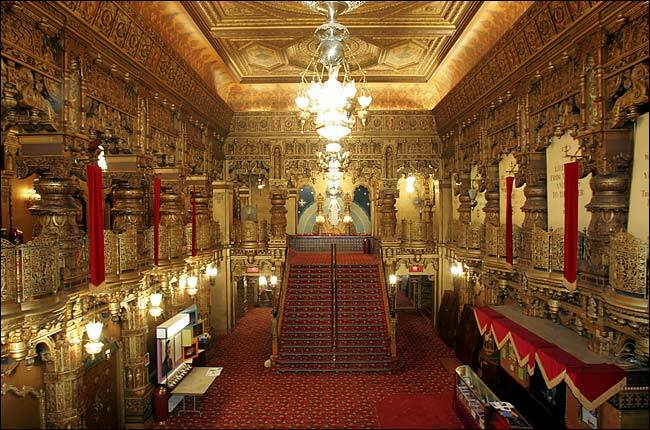 Pictured above is the Loew's Wonder Theatre at 175th Street in New York. This morning's Sunrise Serenade was "Me And Brother Bill" by Louis Armstrong. Click on the song title to listen courtesy of Jazz On Line. Felix the Cat returns in this 1936 short about his attempts to find a companion for his pet goldfish. The quality of this copy is not the best, but the story and gags are entertaining. From the Internet Archive, here is Felix the Cat in Neptune Nonsense. 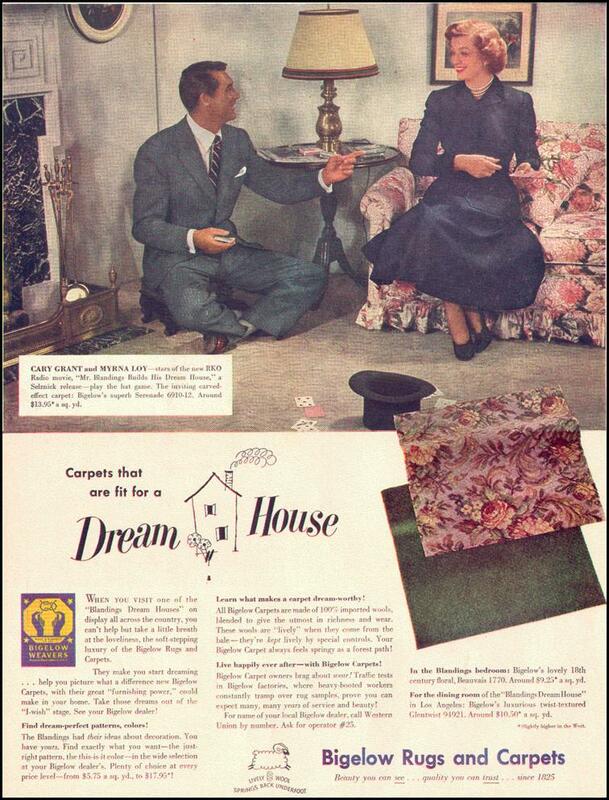 While product placement in movies of the 1940's may not have been as noticeable as today, there was marketing based on film. 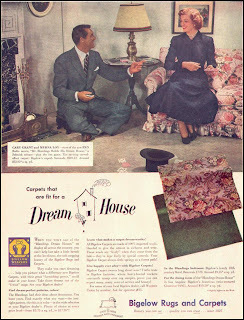 This posting from Vintage Ads shows Cary Grant and Myrna Loy, stars of the 1948 film, Mr. Blandings Builds His Dream House, enjoying the Bigelow carpent their dream house no doubt contained. This morning's Sunrise Serenade was another encore from almost a year ago. Maybe these things go in annual cycles? Anyway, it was "Choo Choo Ch'boogie" by Louis Jordan and his Tympany Five. Click on the song title to listen courtesy of Jazz On Line. While the Davis 3 Wheeler gets top billing in this 1948 short subject posted on Boing Boing, my favorite is the car designed and driven by Gordon Buehrig (designer of the famous "coffin nose" 1936 Cord 810 and 812), with its turning fenders and aircraft-inspired controls. Today's Sunrise Serenade was an encore from almost a year ago, "Free For All" by Artie Shaw. Click on the song title to listen courtesy of Jazz On Line. The playlist for the March 23, 2011 broadcast of the Swing Shift Shuffle has just been added to the playlist filing cabinet. 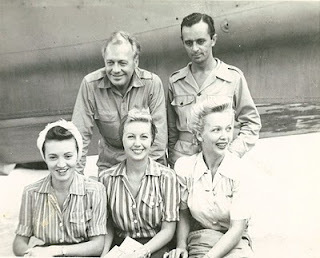 Jack Benny and friends did a USO tour in 1944, and Film Noir Photos has a set of images from that trip. Below, Jack Benney, Larry Adler, Jean Brummer, Martha Tilton and Carole Landis on an island base. This morning's Sunrise Serenade was "For Dancers Only" by Memphis' own Jimmie Lunceford and his Orchestra. Click on the song title to listen courtesy of Jazz On Line. The Red Hot Lindy Hop lesson and session continues this Friday with a lesson by Jaredan and Amanda, plus live music by J. Thomas and the Swinging Monkeys. Band cover $7. Dress like you are going out! Today's Sunrise Serenade was "Bouncin' On A V-Disc" by Fats Waller. Enjoy recording of the track from YouTube. Not too long ago, I posted about an item on Golden Age Comic Book Stories featuring science fiction and fantasy covers from the Startling Stories series. Continuing on that theme, GACBS posted a series of Startling Comics covers. I was faced with the usual dilema. Which of the over 40 comic book covers should I post here? They all have great characters: "Captain Future, Man of Tomorrow"; "The Fighting Yank, Super Patriot"; "Pyroman-America's Blazing Battler"; and "Lance Lewis, Space Detective." This cover, however, had the extra-special element. Challenge the conclusion, if you can, that the robot on this January 1948 cover is not the original prototype for "Bender" from the Matt Groening TV series Futurama. Sunrise Serenade: Do You Wanna Jump, Children? Today's Sunrise Serenade was "Do You Wanna Jump, Children?" by Count Basie and his Orchestra. Click on the song title to listen courtesy of Jazz On Line. In this early (around 1940) Woody Woodpecker short, Woody scoffs at the other birds who fly south for the winter, and finds himself in a fight to stave off starvation with a hungry cat. From Universal Studios and the Internet Archive, here is Pantry Panic. 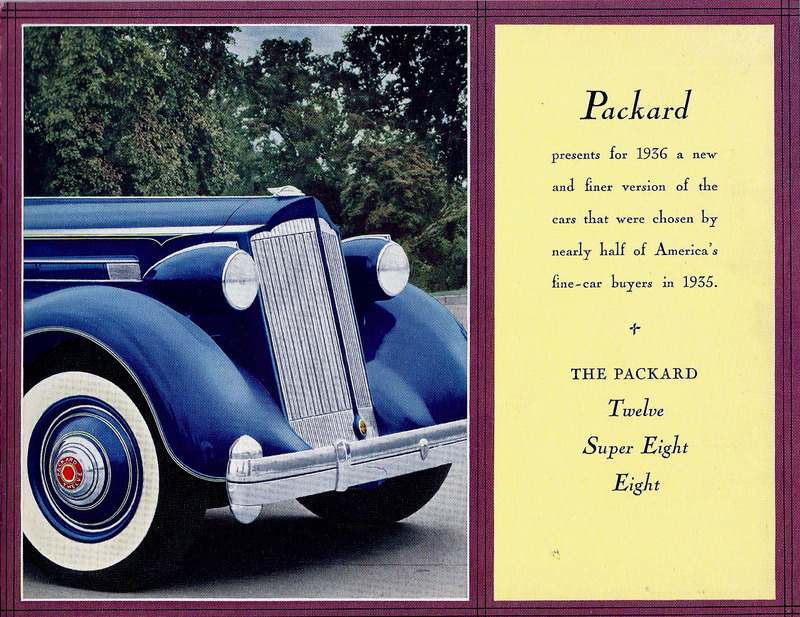 Automotive journalist Hans Tore Tangerud of Norway has a great collection of images from American Car Brochures, including many from the Golden Age of American motoring between the World Wars. This morning's Sunrise Serenade was "King Porter Stomp" by Benny Goodman and his Orchestra. Click on the song title to listen courtesy of Jazz On Line. Happy Saint Patrick's Day! 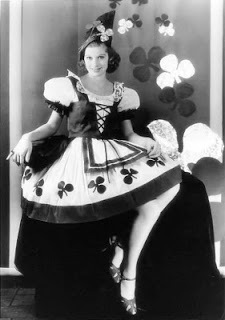 Film Noir Photos posted this picture of Lucille Ball decked out in shamrocks for the holiday. Once again, my unconscious seems to have the holiday's mixed. This Saint Patrick's Day, the Sunrise Serenade was "Christopher Columbus" by Fletcher Henderson and his Orchestra. Click on the song title to listen courtesy of Jazz On Line. The playlist for the March 16, 2011 broadcast of the Swing Shift Shuffle has just been added to the playlist filing cabinet. Thanks to Boing Boing for referring me to this post about the Boeing 314 "Clipper" aircraft that made long range air travel a reality in the 1930s and '40s. No sardine-style "economy" seats on these planes. The Passenger Compartment: The interior of the passenger cabin was the height of luxury for the time, and would surely impress today. In the lounge, travelers had room to spread out and play backgammon or put together puzzles. When it was meal time the lounge converted into a formal dining room, complete with fine china and five star service. When the evening arrived, all compartments converted into bunks with dark curtains and high quality sheets… perfect for dreaming of warm Pacific beaches. This morning's Sunrise Serenade was "Melodrama In A V-Disc Recording Room" by Benny Carter and his Orchestra. Click on the song title to listen courtesy of Jazz On Line. The weekly Red Hot Lindy Hop lesson and session continues Friday with a lesson by Mike & Jeska and music by Jeska. Free admission before 7:00 p.m., and $5 at the door afterwards. Dress like you are going out! Next week, March 25, 2011, is live band night with J. Thomas and the Swingin' Monkeys. Today's Sunrise Serenade was "Stormy Weather" by Glenn Miller and the Army Air Force Orchestra. Click on the song title to listen courtesy of Jazz On Line. In this nice little 1934 short subject, posted by Vintage Ads, Boris Karloff (Frankenstein) and Bela Lugosi (Dracula) play a game of chess to determine who will lead the parade in the Screen Actors Guild Film Star Frolics. This morning's Sunrise Serenade was "Sweet Sue" by the Benny Goodman Quartet. Click on the song title to listen courtesy of Jazz On Line. In this 1935 animated short by Ub Iwerks, Humpty Dumpty, Jr. and Easter Egg escape a villianous "Bad Egg" by falling into a pot of hot water, thus becoming "hard boiled" characters. (Rimshot). From the Internet Archive, here is Humpty Dumpty. Everyone knows that during World War II, women took over many jobs performed by men so the men could serve in the military. The result? "Rosie the Riveter" et al. This posting on Boing Boing, however, reveals the women who worked as top secret human "computers" for the military, performing the complicated mathmatical calculations necessary to create ballistics tables for weapons. Several eventually helped program the first vacuum tube computer. This morning's Sunrise Serenade was "Noah" by the Golden Gate Quartet. Click on the song title for a sample from emusic, or click here for the album page. 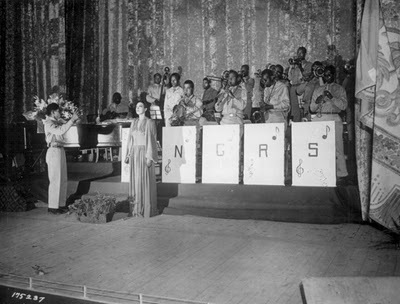 Film Noir Photos posted this shot of Josephine Baker signing the National Anthem in a U.S.O. show for troops in Oran, Algeria in May 1943. Today's Sunrise Serenade was "Tin Roof Blues" by Tommy Dorsey and his Orchestra. Click on the song title to listen courtesy of Jazz On Line. The playlist for the March 9, 2011 broadcast of the Swing Shift Shuffle has just been added to the playlist filing cabinet. 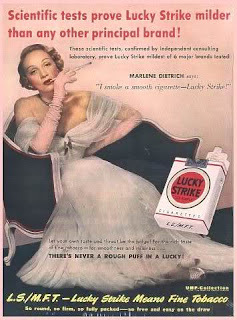 Here is another advertisement that will grow increasingly shocking as the years pass. Posted by Vintage Ads, Marlene Dietrich corroborates the "scientific evidence" that Lucky Strikes were smooth cigarettes. This morning's Sunrise Serenade was "Wah-Dee-Dah" by Cab Calloway and his Orchestra. Click on the song title to listen courtesy of Jazz On Line. The Red Hot Lindy Hop weekly lesson and session continues this Friday with a lesson by Kirk and Michelle and music by Alexis. Free admission before 7:00 p.m., and $5 at the door afterwards. Once the Golden Gate Quartet gets in my unconscious, they tend to do encores for a while. Today's Sunrise Serenade was the Quartet singing the cautionary tale of the atomic age "Atom And Evil." Click on the song title for a sample from emusic, or click here for the album page. 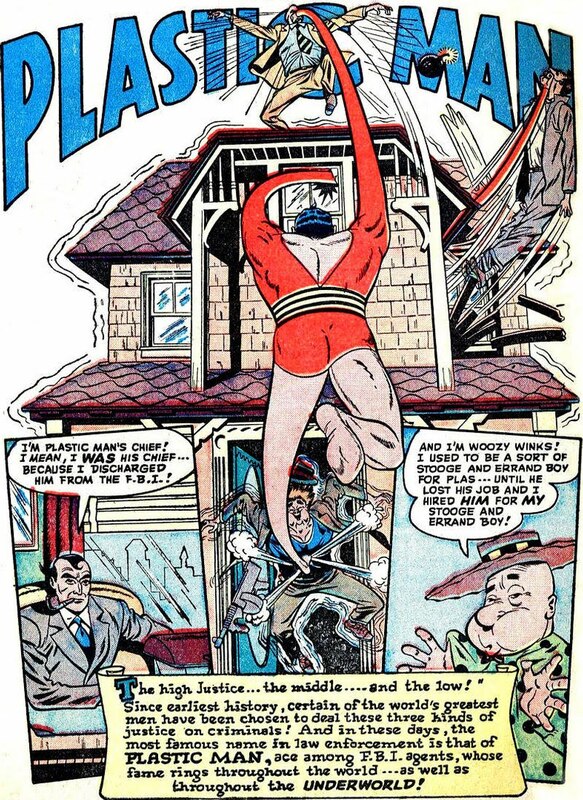 I did not realize that Plastic Man went back to the 1940's. 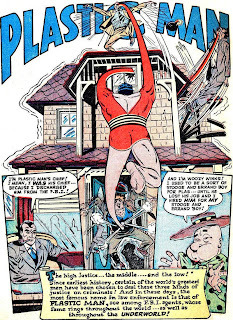 Pappy's Golden Age Comics Blogzine posted this scan of Plastic Man #11 from 1948. The FBI fires Plas, and he gets a job as a stooge for his former stooge. This morning's Sunrise Serenade was "Travelin' Shoes" by the Golden Gate Quartet. Click on the song title for a sample from emusic, or click here for the album page. The star of this 1935 Looney Tunes short is "Beans," who sneaks into the Warner Bros. studio and causes chaos. From the Internet Archive, here is Hollywood Capers. Remember those Warner Bros. cartoons where a pair of dogs or mice get into an automated "house of tomorrow," and eventually get into all sorts of trouble? 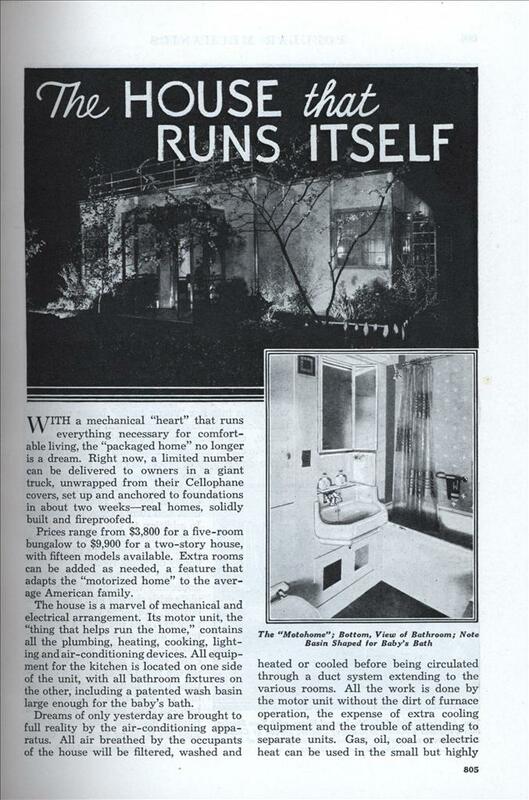 Apparently, automated homes captured the public imagination back then, as demonstrated by this June 1935 issue of Popular Mechanics posted by Modern Mechanix. This morning's Sunrise Serenade was "Don't Sit Under The Apple Tree" by Glenn Miller and his Orchestra. Click on the song title to listen courtesy of Jazz On Line. Well, March 3, 1931 was a musical day in more ways than one. According to The People History, on that date, the Star Spangled Banner officially became the national anthem of the United States of America. 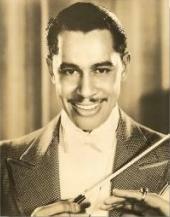 On the same day, Cab Calloway recorded "Minnie the Moocher," the first jazz recording to sell one million copies. Today's Sunrise Serenade was "At Your Beck And Call" by Glenn Miller and his Orchestra. Click on the song title for a sample from emusic, or click here for the album page. The playlist for the March 2, 2011 broadcast of the Swing Shift Shuffle has just been added to the playlist filing cabinet. The weekly Red Hot Lindy Hop lesson and session continues this Friday with a lesson by Matt and Amanda and music by Amanda. Free admission before 7:00 p.m., and $5 at the door afterwards. U of M Swing every Monday, Fieldhouse Room 118 from 7:00 to 9:45 p.m. Free taster lesson from 7:00-8:00 p.m. Topics vary from week to week and include East Coast Swing, Lindy Hop, Charleston, Blues and Balboa. All are welcome and no partner is required. Open practice from 8-9:30 pm. Improve your moves during this dance time. Ask questions, come practice your swing dancing and have fun with other Memphis swing dancers! This morning's Sunrise Serenade was "More Than You Know" by Teddy Wilson and his Orchestra, featuring Billie Holiday on vocals. Click on the song title to listen courtesy of Jazz On Line. 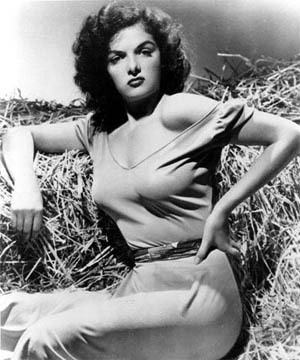 Discovered and contracted by Howard Hughes, Jane Russell went on to appear with stars like Bob Hope and Marilyn Monroe. She died yesterday at the age of 89. Today's Sunrise Serenade was "I Got A Right To Sing The Blues" by Cab Calloway and his Orchestra. Click on the song title to listen courtesy of Jazz On Line.